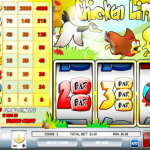 Chicken Little is a 3 reels 1 payline slot game developed by Rival. Like many other 3 reel slot game it is very simple but can also be just as engaging. Unlike other games this one also has some bonus features so read on! The Wild in this game is the Chicken Little symbol and will substitute other symbol to form a winning combination. your wins will also come with a 2x multiplier. 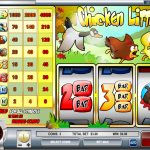 The Wild is also the Jackpot symbol and 3 little chickens will pay you the highest amount! 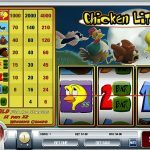 Chicken Little is a lot of fun especially for those of you who love 3 reel slot games. The bonus feature is cool for the genre but the graphics is a little basic. The coin number and range give you a nice range of bets to suit all styles. If you really care about the environment maybe you should consider playing Bust-A-Vault a 3 reel slot by Rival.